Ban on cow slaughter in Maharashtra. 5 yrs jail, Rs10,000 fine for possession or sale of beef. Our dream of ban on cow slaughter becomes a reality now: Devendra Fadnavis, CM, Maharashtra. Beef banned in Maharashtra, 5 yrs jail, Rs10,000 fine for possession or sale. HENB | Mumbai | 3 March 2015:: A law passed by the legislature in 1995 has now received the presidential assent and has become effective. Anyone found selling beef or being in possession of it can be jailed for five years and fined Rs. 10,000. The prohibition has come into force almost two decades after the BJP-Shiv Sena government in the state in 1995 passed the Maharashtra Animal Preservation (Amendment) Bill, 1995. The BJP, now in power at the center, is in favour of a nation-wide ban on cow slaughter as this animal is highly revered by Hindus. Currently a ban exists in some states. ‘The bill banning the cow slaughter in Maharashtra, pending for the last several years, received the President’s assent’, the state finance minister Sudhir Mungantiwar said on Monday. “I am very happy that the President finally gave his assent. We have been trying hard from the last several years to get the bill passed into a law. It not only ensures that animals are not killed, but would also stabilise the agricultural situation. Prevention of the killing of animals will increase the productivity of farms…Even healthy animals were being killed for money, but it will stop now,” Mungantiwar said. Chief Minister Devendra Fadnavis too expressed happiness over President Pranab Mukherjee’s decision to give assent to the bill. “Thanks a lot honourable President sir for the assent on Maharashtra Animal Preservation Bill. 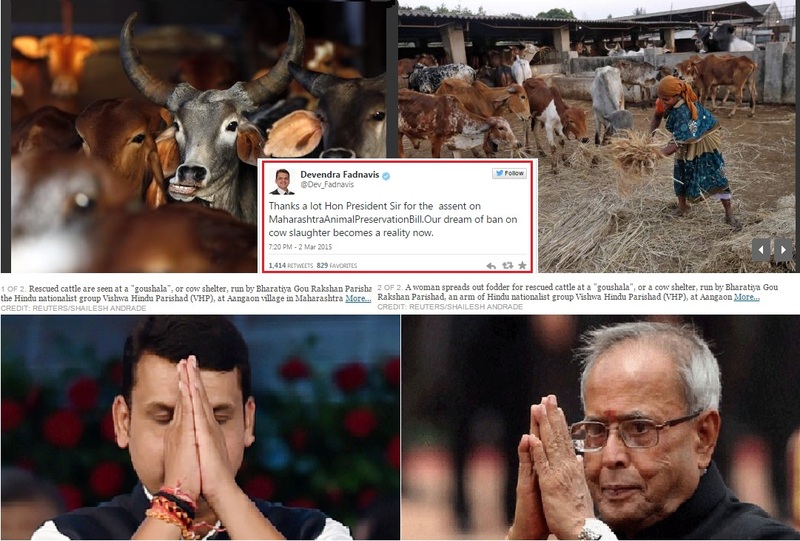 Our dream of ban on cow-slaughter becomes reality now,” Fadnavis said on Twitter. A delegation of seven state BJP MPs led by Kirit Somaiya, (MP from Mumbai North) had met the President in New Delhi recently and submitted a memorandum seeking assent to the bill. “This is a historic step, which has cultural as well as economic implications for the state. We had passed this Act when we were in power in 1995 and had sent it for the President’s nod in 1996. Subsequent governments in the state, however, failed to do the needful to get the Bill implemented. We had promised in our manifesto to bring this Bill and we have managed to do it,” BJP MP from Mumbai Kirit Somaiya said. The President had signed the Bill and sent it to the Ministry of Home Affairs, which then informed the Maharashtra Governor of the decision. The memorandum said that the Maharashtra Animal Preservation (Amendment) Bill, 1995, passed during the previous Shiv Sena-BJP regime, was pending for approval for 19 years. The new Act allows the slaughter of water buffaloes, which is seen as an inferior quality meat and makes up only 25 per cent of the total beef market in Maharashtra, The Indian Express reported. The punishment for the sale of beef or possession of it could be 5 years imprisonment with an additional fine of Rs 10,000. Reuters had earlier reported that Hindu nationalists in India had stepped up attacks on the country’s beef industry, seizing trucks with cattle bound for abattoirs and blockading meat processing plants in a bid to halt the trade in the world’s second-biggest exporter of beef. An official at a beef transport group in Maharashtra state said around 10 vehicles travelling to Mumbai had been stopped in the last week of February, the animals taken forcefully and drivers beaten up by members of Hindu nationalist groups despite carrying valid documents. However, a BJP spokesperson Madhav Bhandari told The Hindu that the party’s efforts to seek a ban on slaughter of calves should not be viewed with a communal lens but keeping in mind the interests of agrarian communities and milk production which are more important for the interest of majority people. With inputs from Huffington Post, Reuters, Indian Express, The Hindu & PTI. Dear sir, I am Satyajit mukherjee is a advocate in faridpur judge court and Genaral Secratary in bangladesh student league in faridpur district and ex general Secratary rajendra university collage student union1998-1999. In 2008 when bangladesh auamilegue form the government then I appointment in assistant private secretary to hons able expatriates welfare and Oversis employment minister eng. Khandker Mossaraf hossain I worked together in 6 year 3 month. Last 16/ April 2015 for some misunderstanding i abcent my job then he leav me it’s nothing but the story are starting here he give me 1 case in kotwali thana faridpur bangladesh for chadabaji then he forced another case in poltan thana for chadabaji, and another 2 casa are file in kotwali thana faridpur for chadabaji. But I know when I surrender they take remand and torchar in bodyly. So I did not surrender their. So last night he arrest my father Manosh Kumar mukherjee in our house faridpur bangladesh and give a case for chadabaji but my father age is 70 year and a retired high school teacher and he is a freedom fighter , sir please give me support my family and protect from that type of disaster . Thanks sir I have no way to protect my family please sir. This entry was posted on March 3, 2015 by hinduexistence in Ban Cow Slaughter, Goraksha, Protection of Holy Cows in India, Save Bharatiya Agriculture and Cow Progeny, Save Cow Movement, Save Holy Cows, Stop Cow Slaughter in India and tagged 5 yrs jail- Rs10000 fine for possession or sale of beef, Ban on cow slaughter in Maharashtra, BJP-Shiv Sena government in Maharashtra, Devendra Fadnavis, Kirit Somaiya, Maharashtra Animal Preservation (Amendment) Bill- 1995, Our dream of ban on cow slaughter becomes a reality.